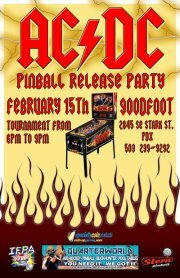 The Goodfoot Pub & Lounge (2845 SE Stark) is hosting an AC/DC Pinball Machine Release Party/Tournament this Wednesday, February 15, 2012. Do you play the silver ball? Got a penchant for pinball? Or maybe your fingers have calluses from making those flippers fly? If so, you’d better mark those calendars for next Wednesday (2/15)! We’re thrilled to be hosting Stern Pinball’s new pinball machine: AC/DC Pinball Machine Release Party & Tournament! Practice on one of the two brand new pinball machines. The second machine will be set up for free play – for the tournament. Doors open at 5pm, qualifying begins at 6pm. Cut-off time is 9pm. Entry fee per attempt at best score is $5. There’s a Super-special grand prize and cash prizes for other top finishers. Sausage, coffee, crafts, pinball, and more. Yup, a fantastic weekend! Portland’s Largest Garage Sale returns to the Expo Center (2060 N Marine Dr) this Saturday, November 5, 2011 from 8am to 5pm. The 2011 Coffee Fair takes place Saturday and Sunday, November 5 and 6, 2011 at the World Forestry Center (4033 SW Canyon Road). I’m attending for my first time this year. Excited! Hungry! The Architectural Heritage Center (701 SE Grand) presents The Ladd & Reed Legacy: William S. Ladd and Simeon Reed this Saturday, November 5, 2011 at 10am. Join Century of Action and the Multnomah County Library this Saturday, November 5, 2011 for a special presentation of Louisa May Alcott: The Woman Behind Little Women. The Cascadia Cup 2011 will be held on Sunday, November 6th starting at 12:00pm at Cbar. Registration is now in limited mode. Contact Dropshot if you would like to play in this Sundays tournament. 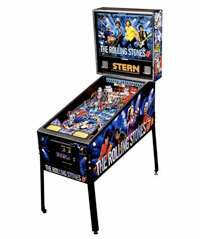 Celebrate the release of Stern Pinball‘s Rolling Stones Pinball machine tonight! Stern and the International Flipper Pinball Association are throwing nine launch parties across the country, and Portland’s Slingshot Lounge (5532 SE Center) is one of the venues. It is $5 to enter and you get one game to record your best score. The top 4 players will then play one 4-player game to determine the winner, 5-8 will also play off for $10. In addition to the tournament machine, two Rolling Stone pinball machines will be set to free play! Register now for Portland Pinbrawl 2011! This third annual pinball tournament attracts the best pinballers in the Northwest, and takes place Sunday, April 17th at Ground Kontrol Classic Arcade (511 NW Couch). The grand prize is a pinball machine. Registration is capped at 128 players, so sign up soon – preregistration stays open until noon on April 16, or until all the spots are filled. Must be 21 or over to compete. Entry fee is $20, but spectators get in free. Find more details and the registration form at CrazyFlipperFingers.com. 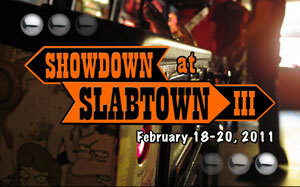 The third annual Showdown at Slabtown takes place Friday through Sunday, February 18 through 20. Slabtown (1033 NW 16th), of course, is the place. You play solo games on machines; your score on a machine is ranked against other people’s scores, and assigned points accordingly; you can only have one score per machine; it costs 1 ticket to play a game, and tickets are $3 each or 4 for $10. Try and get one decent score on each machine. This will likely ensure that you’re in the top 16 by midnight Saturday night. Prizes for are cold hard cash! The Crazy Flipper Fingers website has the rest of the details.